The surface of the lake is perfectly still. The steep hills on either side and the high mountains beyond are empty of human life, save for the occasional lonely farmstead embedded in the hillside. There are no visible roads, no telephone wires to connect this place to the outside world. 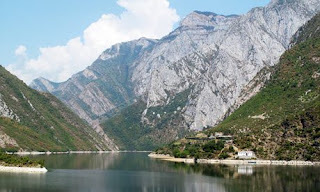 It's not difficult, on the ferry journey along Lake Koman in northern Albania, to imagine you're drifting through a landscape that has lain undisturbed for centuries. d-90s, have left the country struggling to find its feet in the new millennium.